I have been in Arkansas for 36 years, I love this area! There is art everywhere. Crafts are a way of survival and beauty. What a great way to enjoy life through your own hand work. My husband, Dave and I have a small farm on the edge of a ridge in Fox. We raised two sons here. We grow a garden, have a small orchard, raise cows, a pig and chickens. We, mostly Dave, built our log house and have solar power for electricity. It is a wonderful way to live. 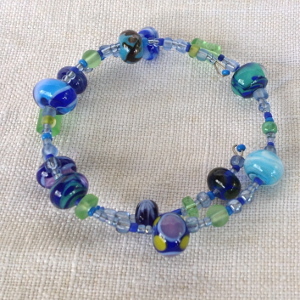 When my hands started to wear out from making mosaic tables a friend suggested I try their glass studio and learn lamp work. I enjoyed it so much I took lessons from Sage Holland and her son Beau Anderson and bought several books for instructions and ideas. My husband was gracious enough to give up his desk in his shop to me so I could have my own work shop. I enjoy trying different patterns. I combine colors from nature that are pleasing to the eye. 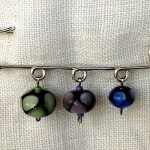 I make earrings, bracelets, necklaces, single beads to place on a cord or silver chain. 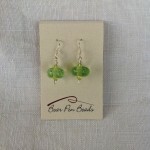 The earrings have sterling ear wires. 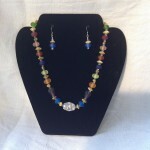 The necklaces have either a sterling or silver-plated toggles or clasps. 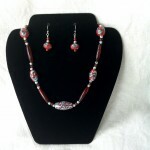 I also make necklaces and earrings to match. DIRECTIONS: From Mountain View take Hwy. 66 West, pass Timbo one mile, turn right on Hwy. 263 South, Fate Morrison Road will be the third road on the right. Turn right, continue until you see the mailbox at the fork, turn left and continue to the end of the road, you will cross a cattle guard. A total of 1 1/4 miles from the highway.